Covering our heads is common in many cultures. Christian women traditionally wore hats to go to church, many Muslim women wear headscarfs. But it’s not just about religion. 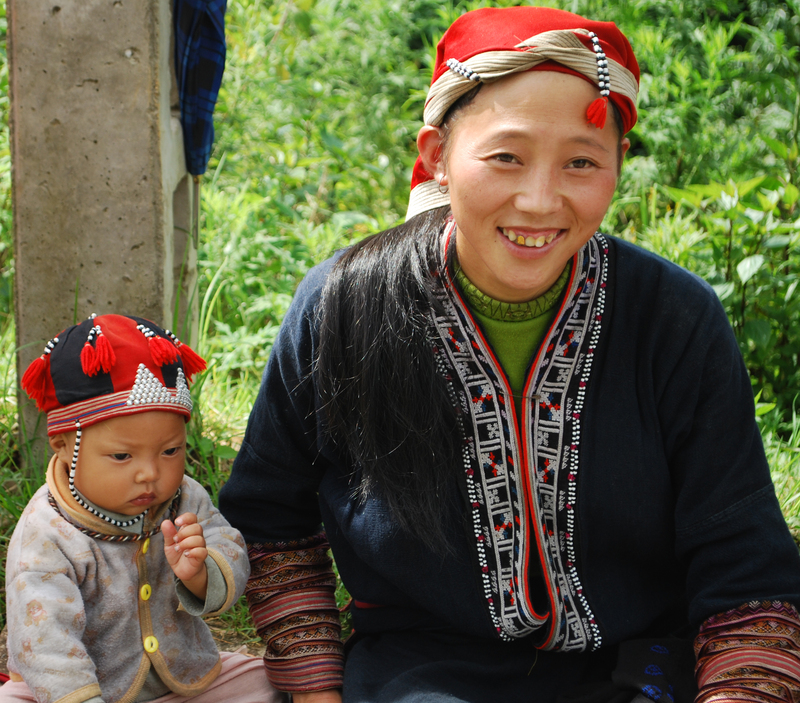 Traditional dress in many countries involves headgear, and some of the most colourful headwear I can recall seeing – in an everyday setting – is the dress of the Hmong people of northern Vietnam. 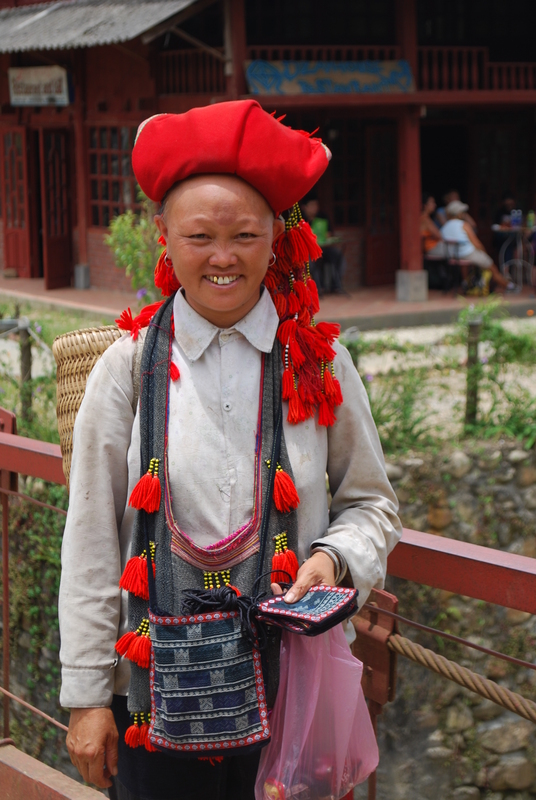 A couple of years ago, I travelled to Sapa and from there to the village of Bac Ha. 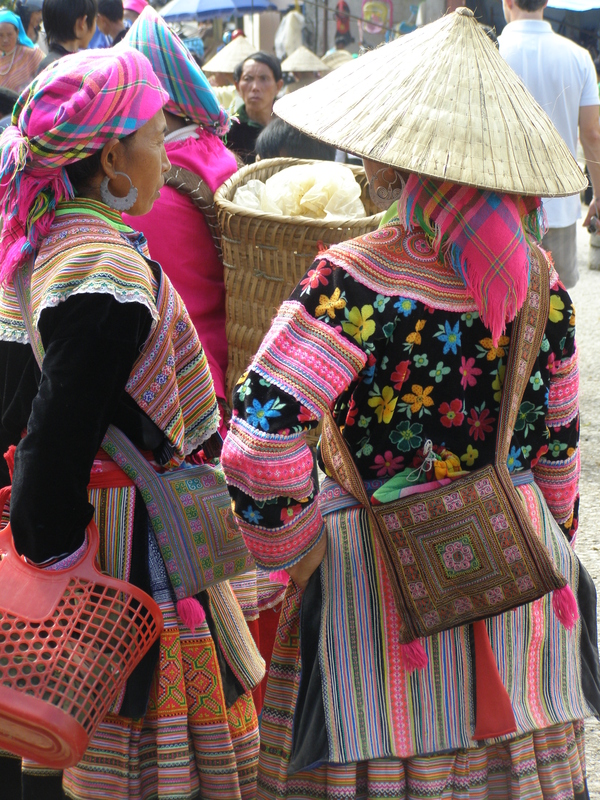 There are many hilltribes in this region of Vietnam and most of the people at the markets were wearing traditional dress. 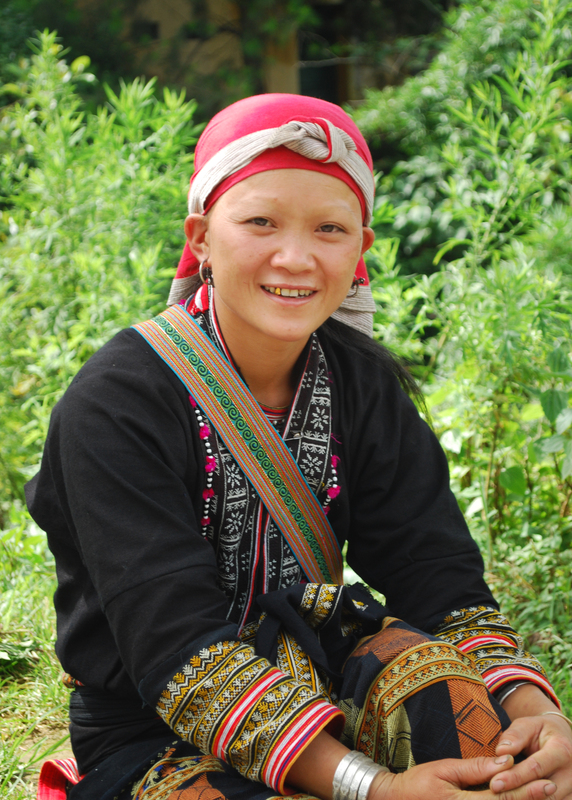 Many of them were Flower Hmong people, known for their brightly coloured and embroidered costumes; others were Black Hmong people, who wear indigo-dyed hemp clothing. We saw clothing being dyed as we hiked in this area too, or hanging on lines to dry. 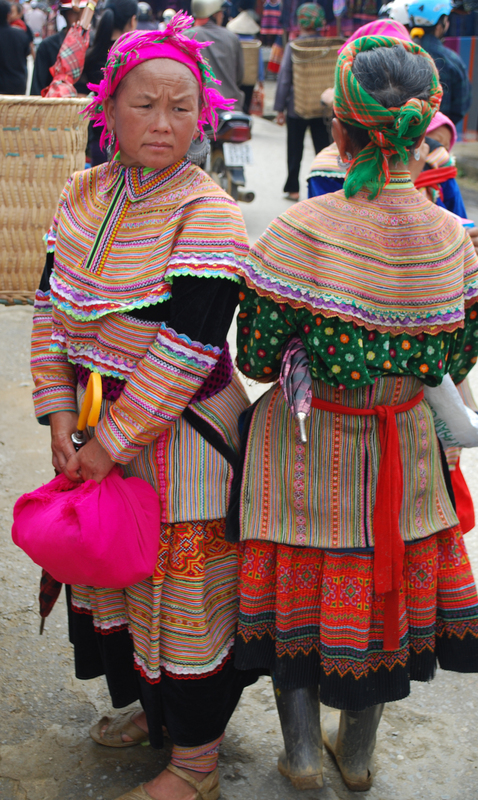 Black Hmong costumes also feature embroidery. I loved this colourful clothing, and the headwear – as so often happens – was often draped in different ways according to the wearers’ own fancy. Thinking about this week’s “hats” travel theme from Where’s My Backpack? 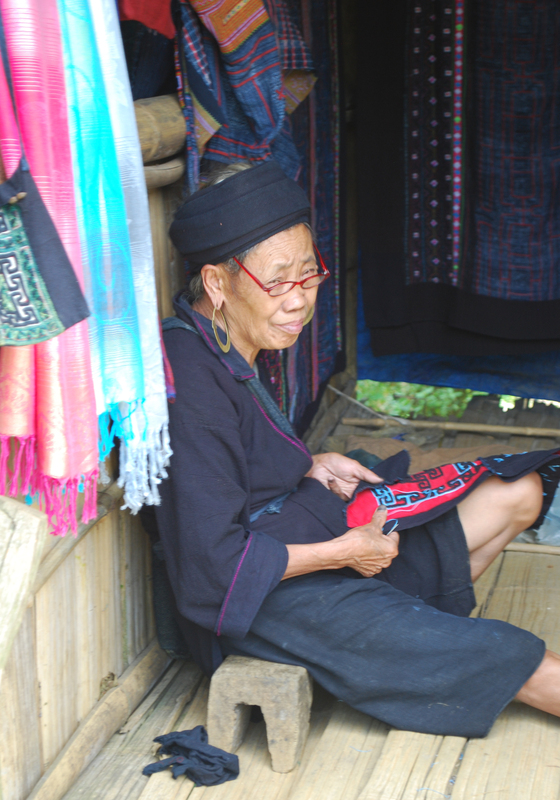 made me recall this fascinating experience at the Bac Ha Markets. Outstanding photos and an informative post. Brilliant take on the theme. Thank you so much! It was a fantastic place to take photos – especially the markets. There were relatively few tourists, and I loved that the people weren’t dressed for any occasion, it was just their everyday wear. Thanks for the kind comment. Great photos Lee. such gorgeous colours in the clothing and headwear. I love that shade of pink. I’ve just been to Inle Lake in Myanmar and the Pa-O women wear red tartan scarves wrapped around their heads, which contrasts sharply with their predominantly black clothing . Outstanding photo and their culture….i love Hmong people and their culture and their tradition ….thanks you for sharing us….. This brings back wonderful memories from my visit to Sapa and Bac Ha too many years ago, Lee. Even for someone who lives and wears colour – moi! – it was still a visual wow! And I think I photographed the same lady with the red glasses too.